Sometime in the mid 80s, a dark-eyed, raven-haired Amazon warrior came rocketing out of South America on a black and pink Honda CBR. Her arrival on the scene sent shockwaves through the sport of women’s tennis. When Gabriela emerged from the locker room in the fourth round of the 1985 Lipton International in Delray Beach her opponent Carling Bassett burst into tears, immediately defaulted, and fled across the peninsula to become a statistician for her father’s USFL football team, the Tampa Bay Bandits. Carling was only the first. Almost every player on the WTA quickly fell victim to this Tacchini-clad Goddess. Hana Mandlikova leapt off a pier in Hilton Head, South Carolina, and though rescued by some quick-thinking dolphins who helped nudge her onto a passing skiff, she never picked up a tennis racket again. Tracy Austin tore her pigtails out with her bare hands and then shaved off what was left. And she wasn’t the only one–in a strange and deluded attempt at emulation, Andrea Temesvari dyed her famous blond locks crow-wing black and changed her name to Gabrieli Sabatina. It didn’t fool anyone. Within a month, she had shaved her head as well. (The women’s tour was beginning to look like the Manson Family by this point!) Helena Sukova quit tennis, had sexual reassignment surgery and spent the rest of the decade as a spokesman for Wrangler Jeans, who almost went out of business thanks to her bizarre series of television commercials. Andrea Jaeger is still in counseling and it’s 2014, for goodness sake. There were other casualties but there is no point in dragging them out into the light. The vanquished know who they are. 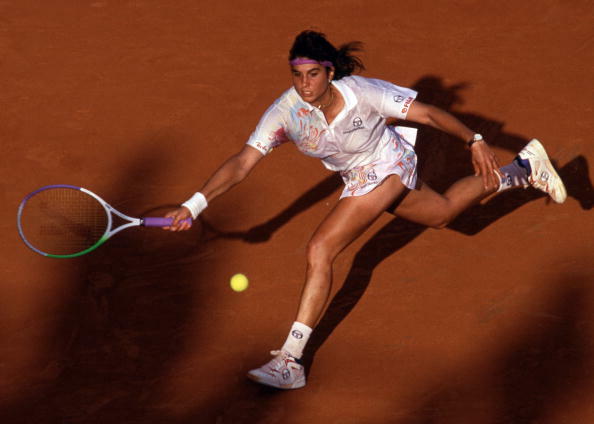 The point is that Gabriela reigned as the Queen of Tennis back then and everyone else was that infamous and oft-cited “chopped liver.” These larger-than-life beings appear once in a generation if we are lucky. I consider the unopened, autographed 100ml box of Gabriela Sabatini Eau de Parfum my most cherished possession and will most likely be buried with it. Beautiful and deadly, like an exquisite carniverous plant; she was truly a Venus fly trap of the ladies’ tennis circuit back in the day.